Strengths: TJ has a special move for all occasions. His Powerline special move can be canceled into five different followups that will suit all forms of reads, allowing him to beat throws, low moves, high moves, projectiles, jumps, and blocking with full combo starters and only marginal unsafety. TJ has several fast special move combo starters (which means he gains access to the reversal buffer for easy execution) so he’ll often convert any mistake of yours into a combo. 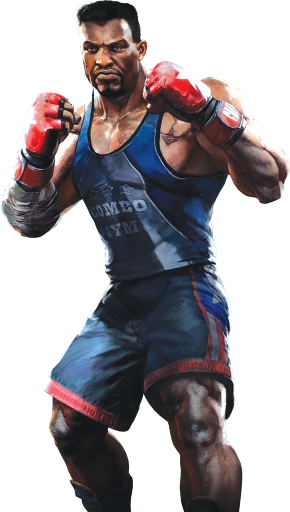 Once TJ is in the combo sequence, he is arguably the most difficult character to reliably combo break in the game; his auto-barrage combo trait and various air combos that lead to multiple recaptures will require extra astute reflexes or a pure guess to break. Weaknesses: TJ tends to use specials more than normals. While this in itself is not necessarily a drawback, it does mean TJ must be played more read-heavy with fewer amazing normals capable of steadying his game, which can make TJ unstable at times. You might make all the right reads and look like a genius, or lose quickly. While TJ has a reversal attack, he needs shadow meter for it, which means if you can catch him without meter, he must sit there and take your offense. Notes: TJ's best meterless punish is Auto-Barrage (see below), as long as you use the heavies first, then the mediums, then the lights. The Auto-Barrage damage ender looks like it does a huge chunk, but because it all happens at once, it's a bit deceptive; it actually tends to do less than counter breaker combos from other characters (although Auto-Barrage has numerous other benefits to boost TJ's general damage). Because his moves are slow, he struggles to tack on as much damage as some of the rest of the cast when using meter, and he doesn't have enough time to start with another move and then transition into Auto-Barrage before the lockout expires. TJ's best punishes all involve heavy corner carry moves, however, which means a counter breaker anywhere on the screen will take the opponent to the corner if TJ uses some meter. Tremor is a strong and important move for TJ. TJ leaps into the air and slams his fist down at one of three set ranges, depending on the strength used. If it makes contact with the opponent, it’s an overhead and will also recapture anyone in the air; it can be used in the middle of combos after a juggle, or to catch people who are trying to jump away from TJ's pressure. If it misses the opponent, it causes a low-hitting earthquake that quickly fills the entire screen in front of TJ. This earthquake does 0 damage, but causes a hard knockdown which lets TJ instantly close the gap. Note that the overhead hit on Tremor is -6, -8, and -10 for light, medium, and heavy, so make sure to punish Tremor when you block. Flying Knee and Spin Fist are standalone special moves and also options out of Powerline; Knee will crush lows but is -8 on block, while Spin Fist is good for close pressure because it is TJ's only safe on block special move opener. The above list of moves only tells part of the story for TJ’s openers, however. TJ also has access to Vortex, an uppercut move that launches the opponent high into the air and follows up with a second strike. Only the shadow version of Vortex is an invincible reversal attack, but the others (particularly the light version) start fast and have good anti-air hitboxes. Shoot Toss is a terrifying dashing command grab where TJ grabs you, turns around, and slams you into the ground, bouncing you into the air. If you hit with either Vortex or Shoot Toss, you will be able to do a juggle combo which could end with a recapture, a flipout, or a standard cashout with shadow Vortex. The actual punch version of Powerline will cause a wall splat near the corner, which leads to an easy manual of your choice. In instinct, TJ is fast enough to even combo Powerlines back-to-back midscreen! Between standard grounded openers, launchers and wall splats, TJ has a plethora of ways to start a combo. If you are on the ground being comboed, TJ will have access to three linkers. When TJ performs Spin Fist linkers, he slowly spins around multiple times, which makes the heavy version extremely easy to break on reaction; it can make good counter breaker bait, and medium Spin Fist is a good option because many players will see two hits and try to wait for a third, which never comes. Flying Knee is his faster, more standard grounded linker that should be used in most lockout situations. Vortex is an interesting linker, because using it causes the opponent to get launched into the air, unlike any other linker in the game. At this point, standard auto-doubles and linkers do not work, since they require a grounded opponent, and TJ will have to begin a juggle combo (which remains breakable). Typically, TJ players will perform a short juggle here and then use one of the three strengths of Tremor to recapture the opponent, at which point TJ can go back to standard grounded combo fare. In order to combo break TJ, you will have to learn to visually tell the difference between these Tremor recaptures. Each version travels a different distance, with light being almost straight up and down and heavy moving a good horizontal distance, and each version has a different number of blue trails emanating from TJ's fist, with one trail for light, two trails for medium, and three trails for heavy. A combination of the distance traveled and the blue trails should be enough to tell the strength before the breaker window expires. TJ's shadow linkers cover all ends of the spectrum. Shadow Flying Knee has the shortest shadow freeze in the game, but each breakable window is very long, so you should have no trouble breaking this linker as long as you don't get caught off guard by the short screen freeze. Meanwhile, Shadow Powerline has the longest shadow freeze in the game, and is always just 4 breakable hits; even if TJ does the 5-hit version, there is no break window at all on the 5th hit. The hits for Shadow Powerline are slightly more spaced out than Flying Knee, but not enough to trip you up in most cases. Shadow Tremor is less used because it does less damage than Flying Knee, but there is a very long gap between the end of the screen freeze and the first hit which can cause timing lockouts. For comparison's sake, take a look at how much later the first hit of Shadow Powerline arrives than the first hit of Shadow Flying Knee! Like most battery enders, Tremor is great at the start of a fight to gain some extra meter, but TJ is less reliant on meter than other characters, so it's not mandatory. His Powerline wall splat ender is quite strong, and if you are anywhere near a wall and are not able or willing to complete a full Auto-Barrage, you should likely use this ender, because it has tremendous corner carry and TJ is a potent threat in the corner. If you do wall splat with Powerline ender, TJ gets a free Shoot Toss command grab, because command throws are not breakable nor can they blow out the KV. The opponent after being grabbed by Shoot Toss will be at max KV, but TJ can either instinct cancel the Shoot Toss to continue the combo mid-screen, or he can set up a dirty mixup on the knocked down opponent. TJ's two unique Auto-Barrage enders are discussed in more detail below. TJ uses Flying Knee opener, then performs all 6 buttons during Auto-Barrage, which triggers his damage ender. If he repeats a button, he gets the advantage ender, which allows for a reset. Auto-Barrage is TJ's unique combo trait and its strength warrants some further discussion. Any time TJ does an auto-double, he can choose to initiate Auto-Barrage by pressing a different button during the first hit of the double; the second hit of the double will change to the new strength. TJ can continue to cancel each subsequent hit, as long as he picks new button each time, although the speed of the attacks will decrease the longer the barrage continues. If you are looking for visual indicators for the different strengths, light attacks are jabs to the face, medium attacks are punches to the kidney, and heavy attacks are uppercuts to the chin. Once TJ begins Auto-Barrage, he forfeits the right to cancel into linkers or traditional enders, although he can still counter break at any point. Instead, TJ can perform one of two unique enders. If TJ manages to hit all 6 buttons without repeating an attack, he activates his damage ender, which is a giant wallop to the head which knocks down with massive force. However, if TJ repeats a button that was used at any point in the barrage beforehand, he performs an "advantage ender", which is a gut punch that does virtually no damage but cashes out all potential damage and leaves the opponent standing, with TJ at +4 frame advantage. This "standing reset" is a strong tool for TJ, who has several mixups at his disposal to beat any option the defender chooses next. Auto-Barrage makes TJ rather difficult to combo break. Players will traditionally determine what strength an auto-double is by reacting to the first hit, and then breaking the second hit, but with TJ, you can never be sure if the second hit will be an Auto-Barrage hit or a standard auto-double. If TJ enters his barrage by switching the strength of the second hit, you will be locked out and TJ will continue the barrage all the way to his damage ender for a punishing 40% damage or more. If you choose to wait for the later, slower hits of the barrage to break, TJ might choose to not enter barrage at all and slip several regular auto-doubles past you unchecked. And even if you correctly determine TJ will enter Auto-Barrage and wait to combo break, TJ can "chicken out" with his backup plan of the advantage ender, which lets him accept a full cash out and standing reset at any time without reaching the slower 4th and 5th hits of the barrage. If you are looking to break Auto-Barrage, try to keep track of when TJ uses a certain strength. In order to complete the full barrage, TJ must use two of each type of strike, so if you haven't seen haymaker uppercuts yet, then TJ hasn't used heavies and you should expect heavies to come soon. If you've seen both uppercuts, then you know that both heavies have been used and you might try to predict one of the two remaining strengths. Narrowing down the possibilities here can help you increase the success of breaking the latter, slightly slower hits of Auto-Barrage. But if TJ alternates between auto-doubles and linkers, full Auto-Barrages, and half Auto-Barrages with advantage enders, coupled with scattered counter breakers on slow heavy hits, it will be difficult to reliably combo break him. TJ is one of the few characters in the game with both a recapture and a flipout, and because he has many opportunities for juggle combos, he makes exceptional use of them. In fact, TJ is in the running for most potent use of flipout in the game, due to his strong options for surprise overheads with Tremor and Superman Punch, and the Shoot Toss command grab. You can even generate a flipout after the Powerline wall splat ender if you do Shoot Toss before it to bounce them up in the air, or after a Vortex launcher ender, giving TJ the added benefit of a damage cashout before his scary reset. Unlike many recaptures in the game, Tremor can be any of the three strengths, making it more than a simple yes-no decision for the combo breaker. While it is not exceedingly difficult to recognize the strengths and break on reaction, it will require some practice at first and is certainly missable even by veteran players. TJ gains a speed boost to all his grounded tools. All grounded moves have faster startup and less recovery, including his dashes, which make him very difficult to contain and also give him access to stylish new combos. It also means that almost normal or special that keeps TJ grounded is massively plus on block, so his offense will almost never end. As a secondary use, if you lose the game with a full instinct gauge, TJ will activate Last Breath and resurrect with 20% health and with half of his instinct gauge turned on, giving him one last chance at a comeback. However, if TJ is hit while on the ground even a single time, he's likely to die, since the opponent will combo him into danger state before TJ gets a chance to break, and he'll get hit by an ultra combo. While Last Breath is situationally useful, TJ players should make a habit of almost always activating instinct manually. By activating manually, TJ gains two extremely important benefits: he gains the full 15 seconds of instinct, and he gets to use the instinct pop to his advantage -- for example, to make an unsafe Tremor or shadow Vortex safe, to generate large frame advantage for scary mixups, or to freeze the screen during his own wakeup and take an appropriate defensive action. The speed boost TJ gains is terrifying, both in movement and to generate almost unlimited block advantage, and it becomes a nightmare for the opponent when pressured. This means the additional 7.5 seconds of instinct will go a long way in helping TJ make a comeback, and it's typically much more valuable than being able to take one extra hit. With everything put together, you should really only use Last Breath if you're forced into it, perhaps because you died to a huge combo or couldn't find an appropriate activation point. And as always, be sure to use instinct in round 1, so you have time to build it again before the end of the match. TJ typically uses special moves for many footsies purposes, but he still has a collection of noteworthy normals. Superman Punch ( +HP) is a pretty fast overhead that covers an absolutely shocking distance of horizontal ground, and can be canceled into openers to start a combo, but because TJ doesn't have any amazing low moves from this range, your opponent may choose to default to stand block. Crouching MK is a decent footsies or mixup low to keep people honest about their blocking. Far HP takes up a good amount of space in front of TJ and is good for corner control. Rollercoaster ( +MP) is a command normal opener that rolls TJ towards an opponent, finishing with a safe on block punch; it is great to use as a meaty attack, especially for players who like to backdash. Stand LK is one of his better normals to use up close, especially to keep a person blocking while you mix up your Powerline options. As an added bonus, if they try to jump away from stand LK, it will flip them out and TJ gets a mixup! TJ also has access to TJ Combinations, a set of target combos that always starts with MP, and ends with either MK or HP. These can be used on whiff in addition to hit or block, and if you choose to end with HP, it will cause a stagger state. These forward-advancing target combos are great to move TJ into range for mixups. Canceling MP > HP into Back Step, for instance, will let TJ hit-confirm a combo due to the stagger state, and if you choose to cancel into Shoot Toss, it will be a mixup on block and also a combo on hit, since opponents in a stagger state are throwable. From slightly beyond sweep range, TJ players should explore using TJ Combinations to control their opponent's space and set up his offense. TJ is the character with perhaps the most reliance on special moves in the game; many of them have numerous applications. But many of them come from the use of Powerline ( +HP). Powerline is a move that sends TJ flying forward with his fist ready. Out of this move, or using a different button other than HP after the back-forward motion, TJ earns many different followups that are central to his gameplay. LP is Spin Fist, a safe on block opener that keeps the pressure high. MP is Shoot Toss, a dashing command grab which is among the best grabs in the game; it leads to a full combo with a Tremor recapture and is incredibly hard to sniff out during pressure. HP is Powerline itself; TJ completes the charging animation with a Balrog Dash Straight-style move that has a hit of armor and goes full screen very quickly and only slightly negative on block. LK is Back Step, a fake out move that makes TJ jump backwards to avoid punishment for any other option. MK is Tumble, a roll which is fully projectile and upper body invincible. Tumble is quite fast as well, so it can be used for surprise positioning from far away, or to roll under a jumping opponent so you can attack them from behind when they land. Finally, HK is Flying Knee, a combo opener that crushes lows from half screen away. Flying Knee is unsafe, at -8 on block, but you will need to be on point to punish due to its rather short block stun. The full combination of Powerline options taken together makes TJ an aggressive, dangerous opponent at many ranges. The addition of a command grab to TJ's arsenal makes focusing on Powerline's numerous options the general idea behind TJ's neutral game. At the midrange, it is difficult for the opponent to keep TJ at bay without a solid read. Blocking loses to Shoot Toss, trying to press buttons can lose to Powerline or Flying Knee, and trying to react to the startup of Powerline is unreliable because of Back Step and Tumble. TJ can keep himself safe while sniffing out your habits by doing Spin Fist, as well, and easily convert into a combo if you flinch. Keep in mind that every option out of Powerline is made even scarier by the speed increase in instinct mode. If the strong wheel of options from Powerline isn't enough, TJ also has Tremor, which will beat people trying to jump back out of Powerline range, trying to throw at close range, or trying to press low buttons. Although Tremor is unsafe on block and TJ has to take a risk to use it, in practice opponents will get hit very often because of how easy it is to panic when TJ is in your face. TJ is very difficult to zone out, as well. The combination of armored Powerline, Tumble, and the hard knockdown, full screen low quake from a whiffed Tremor will give zoners fits, and let TJ slip into his optimal range quite easily. To beat TJ, you must outread his Powerline at the midrange, which is much easier said than done, and you may even have to kill him twice. Show me an Amazonian hunter.